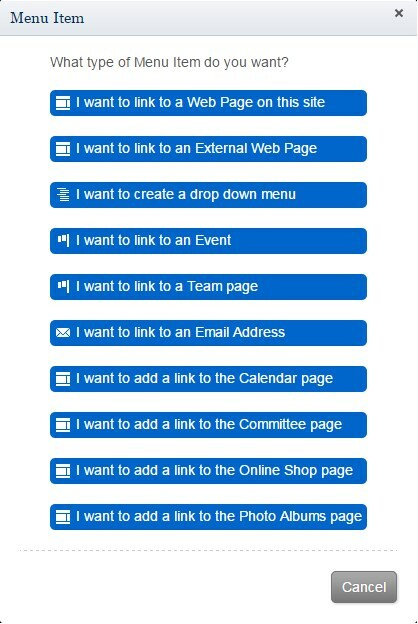 Building the menus that appear across the top of your public web site is always a subjective experience. What makes sense to one person doesn't make sense to another. It is something that changes very regularly, so we decided to build a designer so that you could make the updates yourself. You'll get the hang of how it works in to time, but you may have to think a little bit laterally. Anchor yourself to the ledge and let's plunge into the world of "dropdowns". You should never be starting from a blank slate here. When we set up your shell site, we normally put a couple of menu items in there out-of-the-box, so it'll look a little something like this. Now, if you turn your head down 90 degrees to the right, the menu layout above will be an accurate representation of what the menu on your web site looks like. Keep this perspective in mind. Most of these options are self-evident as to what they create links to. The only one worth discussing here is the I want to create a drop down menu option. This option lets you build a drop-down menu off this new element that you are inserting. You'll see that if you choose to create a drop-down menu, you'l get a new "Add a Menu Item" link that appears indented. This lets you start building the sub-menu.